There’s an extremely good reason Brad Hedlund mentioned server virtualization in his career advice: it has fundamentally changed the Data Center networking. Years ago, we’ve treated servers as oversized IP hosts. From the networking perspective, they were no different from other IP hosts. Some of them had weird clustering requirements, some of them had multiple uplinks that had to be managed somehow, but those were just minor details. Server virtualization is a completely different beast. Let’s take a look at the server virtualization from the networking perspective. This technology allows you to run multiple totally independent servers (virtual machines) inside the same physical server. Obviously each one of these virtual servers needs its own IP address, has to communicate with the outside world and (potentially) belongs to a different security zone than other servers running on the same hardware. 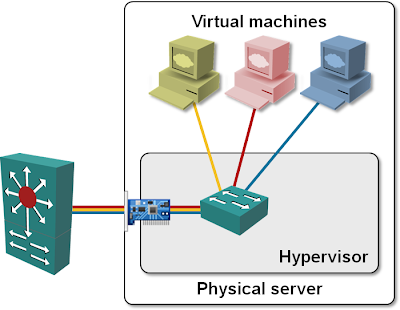 Some VMs might also need to communicate with other VMs running on the same physical server (for example, a web server VM communicating with a database VM). Some people have “solved” the problem by installing numerous NICs (Network Interface Cards) in the same physical server, connecting the server to a switch (or two of them for redundancy) in a “cow milking machine configuration”. Obviously this is an ugly solution wasting money on NIC cards and switch ports (just imagine making it truly redundant). Virtualization vendors have solved the problem in an elegant (in their opinion) way: they’ve implemented a switch inside the virtualization software. All of a sudden, all virtual machines in the same physical server can communicate with each other and the outside world. The communication between the VMs and the outside worlds seems to be solved, but the networking headaches have just started: all of a sudden you have extra switches (over which you have no control) popping up in your network, in some cases even without your awareness, as the server team might decide to deploy pilot VMware or Hyper-V servers without notifying anyone else. The VMware implementation of the switch cannot generate a forwarding loop. It strictly separates uplink and host ports, never forwards a packet from one uplink port to another and drops packets sent from local MAC addresses if they arrive through the uplink port (indicating a bridging loop somewhere else). Hyper-V is not so picky; it’s quite easy to generate a nice network meltdown if you enable bridging between two uplink interfaces. An extra (virtual) switch in the physical server should make the security engineers nervous; after all, sometimes the VMs running in the same physical server belong to different security zones (I leave it up to you to decide whether that’s a good idea or not). No problem, the vendors will tell you, you just have to implement VLANs in your VMware switch and assign virtual machines to different VLANs. End result: not only are we getting extra switches in our network (we could protect ourselves against that with BPDU guard), now we’re getting switches that require trunked ports. The dividing line between the networking team and the server team is thus getting very blurry and they have to start working together to ensure that the server and network settings are aligned and that the new virtual switches deployed in the Data Center do not destroy its design or disrupt its operations. To make the second task easier, Cisco introduced the Nexus 1000V software. It’s a NX-OS control plane implementation running as a virtual machine on VMware ESX. Nexus 1000V uses VMware API to control distributed VMware ESX switches and presents the network engineers the familiar NX-OS CLI and feature set (in-depth description of Nexus 1000V is available in the chapter 9 of the NX-OS and Cisco Nexus Switching book). You'll learn more about networking aspects of the new Data Center architectures in my Data Center 3.0 for Networking Engineers webinar (buy a recording or yearly subscription). A very high-level description of server virtualization is also available in the Next-generation IP Services webinar. I completely agree that server virtualization is changing the data center significantly. One issue I've struggled with is that virtualized hosts that use VMotion require larger layer 2 domains than I'd prefer. I did have a bit of expansion on the VMWare trunking issue. Even when trunking to VMWare servers BPDU Guard and Portfast can be deployed. The VMWare virtual switch doesn't participate in the spanning tree and there is no reason to delay bringing the interface up for to spanning tree states to change. This is identical behavior to trunking to an HP physical server running Windows. In these cases the only function the trunk interface provides is VLAN tagging. One important thing that needs to be mentioned over and over is that IMHO it is the shift of the responsibility that is the most important change over here. Now, we as "pure" technical personnel do not really care about the chain of responsibility in whole organization up to the CEO, however we start to care when we see that it doesn't work, simply because nobody from the management point of view is aware of this shift. One example in the traditional "Vertical Tower Model" of management structure employed in almost every big organizations - servers belong to "Server Management Tower" and network to "Network Management Tower" and in no way they manage devices for each other, or have a common budget. What happens if the VMswitch failes? Who opens troubleshooting tickets to VMswitch provider?